Knowing how to make baked pastas is a wonderful skill to have up your sleeve for easy weeknight meals. Everything goes into one pan and into the oven for 30 minutes, and dinner is done. This recipe, which features two kinds of Italian sausage and lots of gooey cheese, is the perfect contender. You can save even more time by prepping in advance. Follow the steps below and, instead of baking the pasta, cover it with foil and stick it in the fridge. When you get home from work, pop it into a preheated oven and dinner will be ready in a snap. Remove the sausage links from their casings. Heat a heavy-bottomed pot, such as a Dutch oven, over high heat and add the sausage, breaking it up with a spoon. 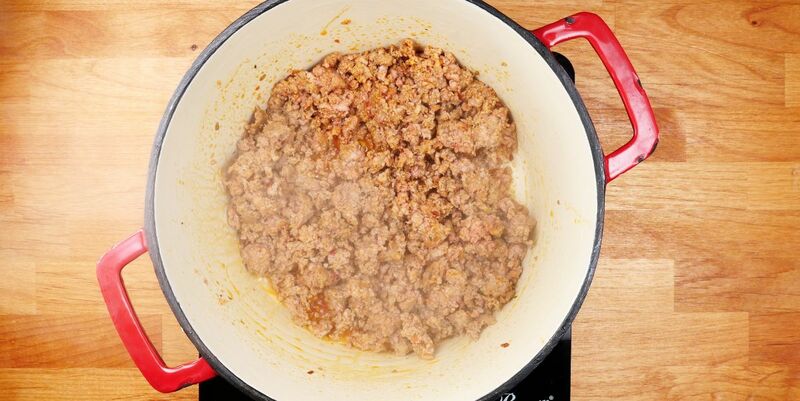 Cook the sausage until it's nicely browned on all sides, and remove from the skillet, leaving the fat behind. Pour off all but about a tablespoon of the fat. Add the onion and cook, stirring occasionally, until tender, about 5 minutes. Add the garlic to the pan and cook until just fragrant (about 1 minute). Add the crushed tomatoes, salt, the red pepper and the basil. Bring to a simmer and cook, stirring occasionally. Prepare the pasta according to package directions, draining the pasta when it is one minute away from being done (still a bit al dente in the middle). 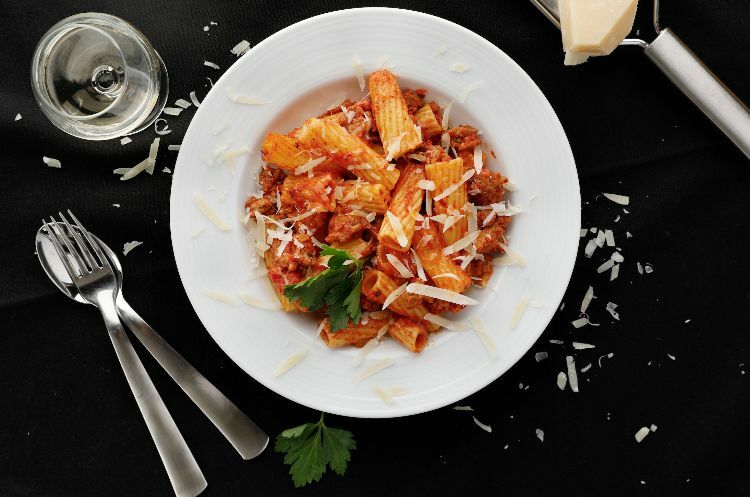 Place the pasta in a large mixing bowl. Add the sauce by the ladleful, mixing well to ensure the pasta is evenly coated. Add the sausage and mix well to combine. Pour the pasta mixture into a casserole dish. Sprinkle the mozzarella over the top and bake until the cheese is bubbly and just starting to brown, about 15 minutes.